everyone and welcome to the Cocktails and Dreams blog hop hosted by Gill McCall. If you have just happened upon my blog and would like to join the hop from the beginning click here to go to Gill's blog. Alethea http://lilodesign​s.blogspot.com/ then you are on track with the hop. I love cocktails and hopefully you do too and I have created 2 projects to share with you. 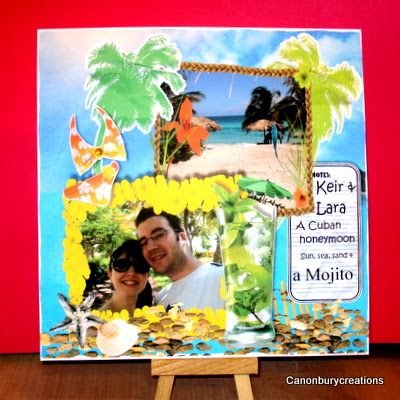 The first is a scrap page that I made for my son and DIL with memories of their honeymoon in Cuba 3 years ago. I used Craft Artist, a digital programme, to create the page and decoupaged some of the elements to give depth. My 2nd creation is a card .The background is printed with names of cocktails and the toppers are photos of various cocktails that have been framed. I glazed the glasses to create texture. Great projects Val! The scrapbook page is fantastic! Are you going to give it to Keir and Lara? You can tell it's filled with special memories for them. The card itself is great too. Better not concentrate too much on it though....or I'll be wanting a cocktail immediately! It's only 10.35am!! Two great projects Val - you can tell that cocktails are your "thing"!!!! lol Bet Keir & Lara will love the scrapbook page. Your blog heading is so pretty, Valerie. Great creations. The young couple will surely appreciate that scrapbook page. Thanks for commenting on my blog today. I hope you were able to pick up my sentiments and put them to good use. Wow! Val, they will love you for the beautiful memory page! The card is just is so much fun and wonderful! I could use one of those about now!!! What fun projects Valerie! Love that layout - funny how we in the US don't even consider Cuba as a honeymoon place but it looks beautiful! Love that card - those cocktails look good enough to drink! what great projects! I love the layout. What a romantic honeymoon location!